Will you be throwing one last awesome BBQ for the summer? That’s what the Labor Day weekend was made for! 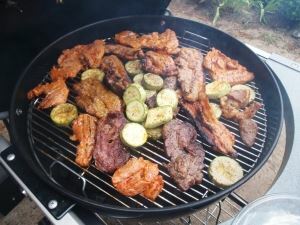 Before you fire up the grill, you might want to do a survey around your yards and home to see what could be tossed out. Obviously, anything that fits into a trash can be gotten rid of before your guests show up. But when it comes to those bigger items, you’ll need to call in the pros from Junk King. Junk King is one of those service companies that can provide instant gratification. You’re going to notice the difference a clutter free yard and home makes right away. Those things that have been an eyesore for months (or years!) can finally be taken away. In your yard, this could mean a swing set that the kids have long outgrown. It could also mean a hot tub that is broken or a tool shed that is about to fall down. Those a big dismantling projects that your Junk King crew will be happy to take on. You’re going to reclaim a lot of yard space by getting rid of things like that. Over in your garage, you can get the Junk King crew to remove those auto parts, tires, rusty tools, exercise equipment and sports gear that nobody is ever going to use again. When Junk King is through, your garage could be looking like it did when you first moved into the home. You’ll certainly be able to park your car in there once again for sure! Moving into your home, Junk King can help you clear out the clutter from your closets, under your bed and any other space that you’re keeping junk. There have been plenty of happy Junk King customers who have been able to create a home office or studio thanks to all the junk that is taken away. Everything you’re getting rid of is going to be loaded onto the Junk King truck. When your junk is loaded, you can get back to your day. The Junk King crew will be looking for the best spots to drop off your stuff. That might be a charity or a recycling center. If they can keep junk out of a landfill, then that’s just what Junk King will do. The end of the summer could be the beginning of a clutter free home thanks to a junk pickup session from Junk King. This entry was posted in Labor Day Preparation Junk Pickup In San Diego and tagged Junk King, junk pickup, Labor Day on August 20, 2014 by John Bonavita. Last updated August 1, 2017 .